We are engaged in manufacturing and supplying a wide range of Collets and Guide Bushes. The offered Industrial Collet and bushes are fabricated using premium quality raw material in adherence with the international standards. Moreover, the offered products are well-known among clients for their high tensile strength, optimum functionality, dimensional accuracy and corrosion resistance. Furthermore, these are offered in various specifications to meet the varied needs of clients. 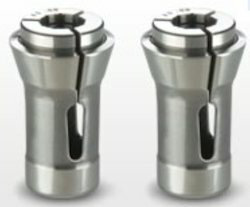 Industrial Collet hese are offered in various specifications to meet the varied needs of clients. We make Carbide Lined Guide Bushes for various sliding head machines. Few of the machines being Petermann, tornos, Behler, Star, Citizen, Strohm etc. We have many satisfied customer's. Apart from concentric guide bushes, we are also making asymmetric guide bushes as well. We make good quality Traub Collet. We make these collets from spring steel . We also make carbide lined collets . All sizes are made as per order so odd sizes can also be made.apart from round shape, we also make square, hex , rectangular shaped collets for special purposes. We make collets and guide bushes for sliding head machines. We are capable of making these Collets Sliding Head Machines and guide bushes for machines like Petermann, Star, Tornos, Citizen, Strohm, Behler , T sugami, Nomura etc. We make these guide bushes in carbide lining . The range of bore starts from as low as 1 mm. Collets Sliding Head Machines make these guide bushes in carbide lining . The range of bore starts from as low as 1 mm.